Rhos Country Cottages are situated one mile down a single country lane, off the B4411 road at Rhoslan. Nearest bus stop is at the junction of the A487 at Glandwyfach (Bryncir), or at the centre of Criccieth. Nearest train station is at Criccieth. Hendre cottage is reached via a single leafy farm track with one speed bump. Tarmaced parking and reversing area on slight slope. Level paved patio and lawned garden and also a sloping lawned garden area on one side. Narrow gated access to the field. One step to the front entrance through PVC door. From kitchen area there are three steps down to the hallway and lounge. Three bedrooms and bathrooms upstairs. Downstairs shower & separate toilet. Rhos Ddu cottage - approached along a private, tarmaced private lane. Level tarmaced parking area with one step onto a level paved patio and level lawned garden. The entrance doorway has one step. Two bedooms and bathroom up stairs. Stairs with banister rail to one side. Rhos Wen is possibly suitable for the less mobile. Reached along the same private tarmaced lane as Rhos Ddu. Rhos Wen is single storey and has level parking with a 2" step to paved area towards front door. Front door is 30" wide and has a 3" step to enter through. Both patio door and back door entrance have an 8" step. All bedrooms are on ground floor. All internal doors are 29" wide. The bath is a standard size and the en-suite has a standard corner entry shower cubicle. Bathroom and shower have no grabrails. 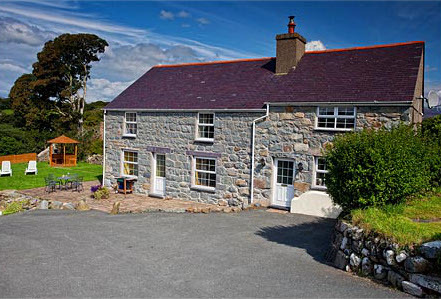 Betws bach farmhouse is situated on a hillside, approached via a tarmaced drive with a gradiant of 1:10. Parking on slight slope with a large level paved patio to front door and stable-door. Large lawned garden on slight slope. Wide front door (38" - 97cm) with no step. Internal doors on ground and first floor are standard width (29" - 74cm), including stable door that leads out from the snooker lounge. The top floor bedroom and shower room have a low doorway. From the lounge to the snooker lounge there are 3 uneven stone steps, three bedrooms and bathroom on first floor, and one bedroom and shower room on second floor. Stairs to first floor in two fleets (with a window) at the middle landing. The top floor is reached via two fleet of stairs with limited headroom to the last fleet before the top landing which has good headroom. Doors height 68" x 26" wide. The top floor bedroom and shower room have sloping ceilings and low beams. Ample source of natural light through velux windows and dormer windows. The rest of the property has small sash windows and a limited supply of natural light.